The number of new daily high temperature records in the contiguous 48 states of the U.S. declined below the number of low records in October for the first time in 22 months. Nevertheless, the first half of November has already rebounded to wipe out that deficit. For the month to date, heat records are outnumbering cold records by a ratio of 3.1 to 1. 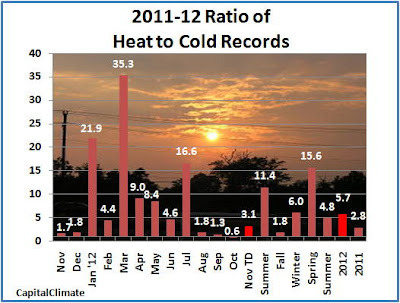 With only 6 weeks left in the year, the 2012 ratio to date of 5.7 to 1 is almost double the 2011 ratio. 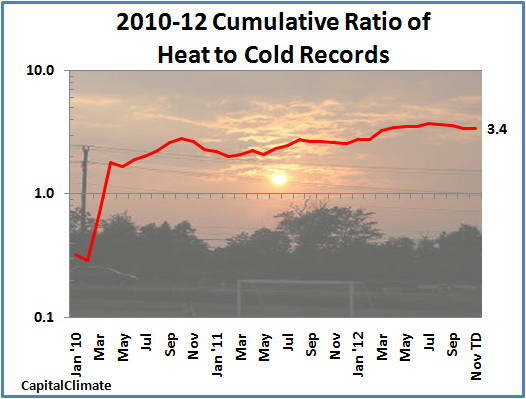 Although the ratio of heat records to cold records has declined substantially in the last several months, double-digit ratios in January, March, and July have kept the year-to-date ratio considerably above last year's. Cumulatively, since January 2010 the ratio for the decade stands at 3.4, just slightly below the peak it reached in July of 3.7. 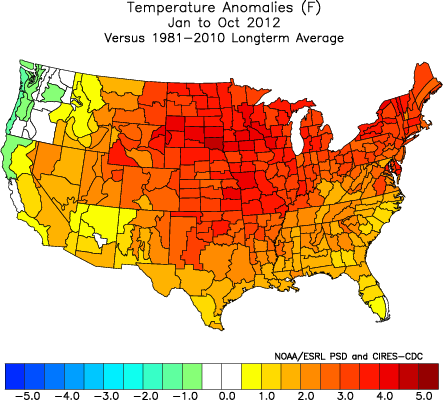 For the year to date, temperatures have averaged above the previous 30-year normal everywhere in the country except along the immediate northern Pacific Coast and part of interior Washington state. Temperatures so far in November have been cooler than normal in most areas east of the Mississippi, particularly from the Ohio Valley through the Mid Atlantic and Carolinas. Temperatures nearly everywhere else have been warmer than normal. 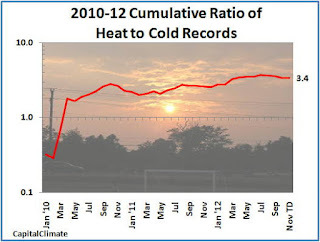 - Monthly ratio of daily high temperature to low temperature records set in the U.S. for November 2011 through November 2012, seasonal ratio for summer and fall 2011, winter, spring and summer 2012, and annual ratio for 2012 and 2011. 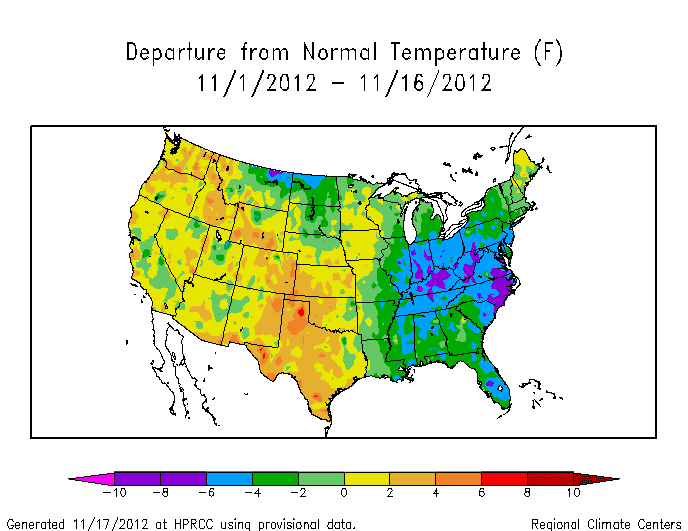 CapitalClimate chart from NOAA/NCDC data, background image © Kevin Ambrose. Includes historical daily observations archived in NCDC's Cooperative Summary of the Day data set and preliminary reports from Cooperative Observers and First Order National Weather Service stations. All stations have a Period of Record of at least 30 years.